Discuss why there is a gap between the spring and the autumn feasts; what does that gap relate to? How have the spring feasts been fulfilled? In the sermon we looked at a number of passages alongside our reading from Leviticus 23. How do these OT readings help us in understanding the feast: Leviticus 23: 23-25, Numbers 10:1-10, Exodus 19? Which NT readings relate directly to this passage, (there are at least 3) Hint: 1 Corinthians 1 Thessalonians and Revelation. How is this relevant to us, and what lessons might we apply? Seek the Lord for direction as to outreach in the year ahead. There are only a few questions here but take each one in as much depth as you can. Why was yeast used in the bread and why were there two loaves – what do the loaves represent? Where is the application for us as a church in the UK in the 21st century? What does it mean to keep the Sabbath? How might we either be too legalistic or too liberal in this? Are these feasts in Leviticus 23 really relevant to us today? If so how, and why don’t we celebrate them within the modern church? As a group discuss each of the first three feasts; how are they a reminder of past things and in which ways do they speak of things that were to come. 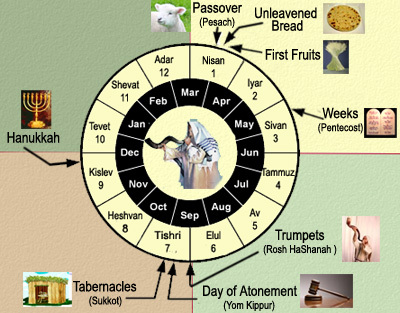 In the sermon we looked at the dates of Passover, preparation, selecting the sacrifice etc. and how the prophecies of Daniel 9, Psalm 118 and Zechariah 9, Luke 11:29 form part of the picture. Discuss how all of this fits together in God’s plan, how tradition has confused things and what this might teach us about the importance of studying the whole of scripture. Please use the points below to guide you in a time of prayer. Who are these verses aimed at, believers or non-believers? Why is it important that God’s people (The Church), put their own house in order [try to look at this from every possible angle]? If God is the builder and the watchmen why do we need to do anything? what is meant, in Jeremiah 6:16, by “the old godly way“, and how do we find it? For Christian’s the message in these few verses is ‘blindingly obvious’, so why do we often find ourselves doing the wrong thing and continuing to think we know best when it comes to certain, if not every, aspects of our lives?